This past week I spent time in the "Oregon Alps," magnificent mountains in Northeastern Oregon State, U.S.A. 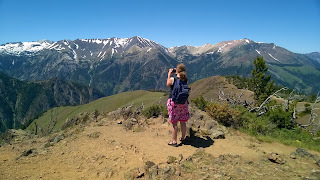 The region is known as the Wallowa Mountains. The lake-bed below was formed at the foot of the mountains by glaciers during the Pleistocene era, only 11,700 years ago. What a sight my family and I enjoyed as we drove on a highway along the eastern shore. But I tried to imagine the sight years ago when the lake-bed was filled with a glacier! I did envision it and I talked about it. This glacier ran from the peaks above to the current lake bed. Today, vacation houses perch contentedly just above the lake on rocky glacial moraine. 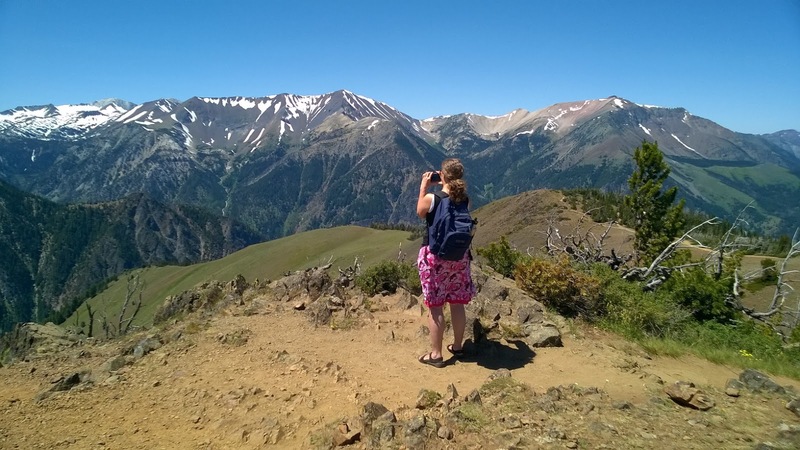 In sum, the former glacier is reduced to a few snowfields in the Wallowa mountain peaks. The remains of the former glacier, now scarcely nothing but seasonal snowfields. Photo copyright Darrell Reeck, 2017. 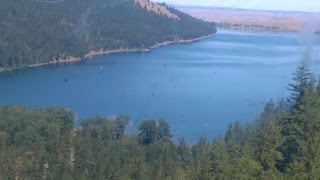 The lake itself is fed by snow-melt that forms into a creek and plunges down the mountainside. 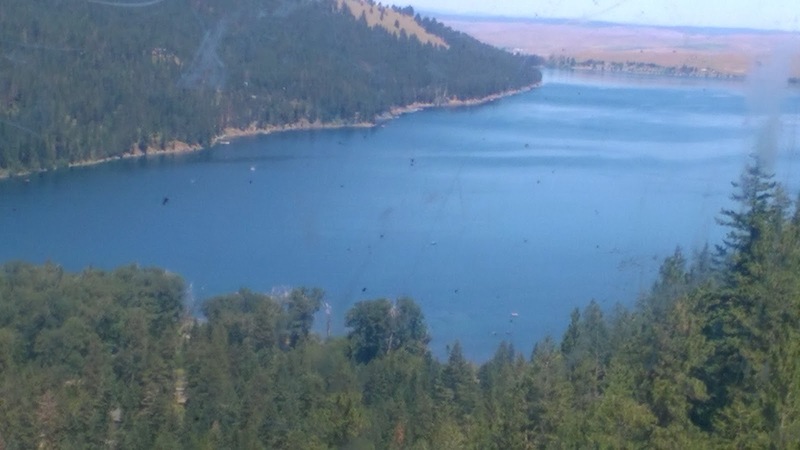 The stream levels out in a meadow bisecting the lawn of the Wallowa Lake Lodge on the east side and a state park on the west side. 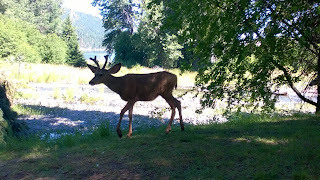 Deer meander along the stream, exciting tourists. Same story (shrinking glaciers) on Mount Rainier, about 260 miles to the northwest of Wallowa. When I visited the Mount Rainier National Park as a youngster fifty years ago, the nose of the glacier extended to within easy sight of the Nisqually River Bridge. 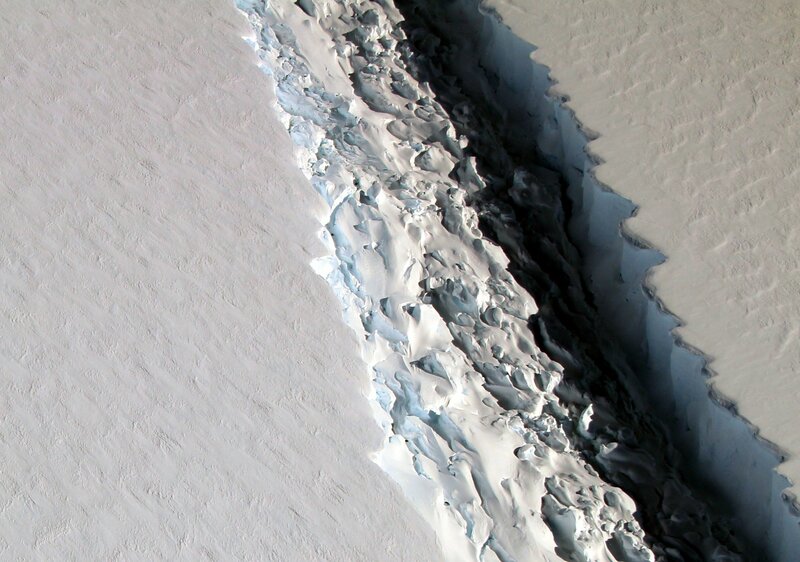 But in an ominously worried tone of voice my Dad told me, "The glacier is shrinking." He was correct. Now the glacier has retreated dramatically up around the corner of a canyon and is not in sight from the bridge. So far, human life has adapted to melting, shrinking ice-fields, ice caps and glaciers. But our scientists have discovered that changes in water stored on mountains and at the poles as ice are coming faster now. They point to the saturation of the atmosphere with higher levels of carbon dioxide. What happens when the polar icecaps begin to melt faster? As the ice turns to water the level of the oceans rises. In fact, scientists have estimated that the level of the seas could rise by ten feet by 2100. That's if melting continues at the present rate. The risk to human lifestyles is immense. The president of the U.S.A. might call all of the above "fake science" or "fake facts". But as a real estate developer, Donald Trump, is "very, very smart" and always lookin' for a better deal. So, it makes sense to let him know that many of his properties are at risk, and his legacy too, by rising sea levels. Just one example: what would a ten foot rise in the level of the Atlantic, along the Florida coast, mean for Mar a Lago, Trump's "summer White House" on coastal Florida? Glub glub. What can you and I do to get Trump back into the conversation about global warming? Call the White House Comments line: 202-456-1111, M-through-F, between 9 a.m. and 4 p.m. Eastern U.S. Time zone. Suggested message: "I support the Paris Accords to slow climate change. You should too. While you're at it, refund the Environmental Protection Agency." And call your Senators, your Representative and your state governor with your message. Just as science can teach us a lot about God's purposes in creating nature (S. J. Gamertsfelder), it can also teach us about our moral duties. One such duty is to conserve the planet for future generations. If we're going to save our moral heritage and our physical basis for existence, we must act. P.S. Important additional information, selected by Dr. Al Eggers, at this link:http://www.rollingstone.com/politics/news/the-point-of-no-return-climate-change-nightmares-are-already-here-20150805. Please copy into your browser and read.